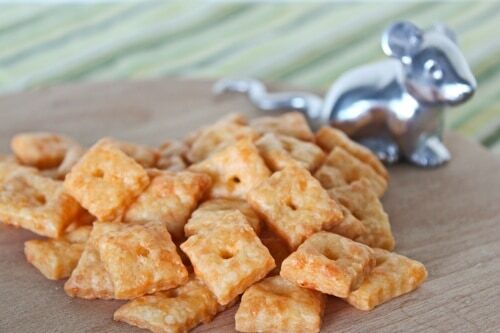 Homemade Cheez-Its Recipe | Good. Food. Stories. Guess what? An improved, updated version of this recipe can be found in my cookbook Classic Snacks Made from Scratch: 70 Homemade Versions of Your Favorite Brand-Name Treats. Buy it now on Amazon , Barnes & Noble, or your local indie bookstore! 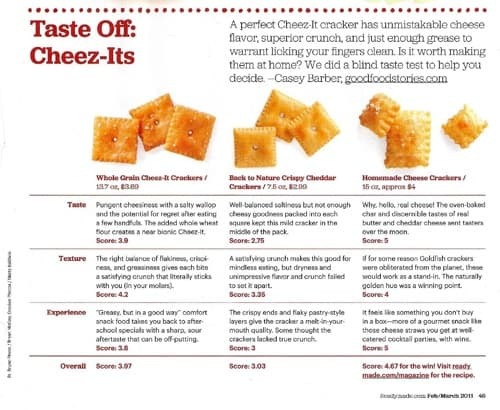 My latest piece for ReadyMade magazine was an assignment that made my junk food-loving heart sing: create a recipe for homemade Cheez-Its and hold a blind taste test to judge them against regular and natural brands. Our highly scientific findings? We discovered that the perfect Cheez-It cracker has superior crunch, unmistakable cheese flavor that doesn’t devolve into pure saltiness, and just enough grease to leave a light sheen on your fingers. But the thing is, there’s no such thing as a bad Cheez-It. Even though the slightly sour aftertaste of one brand was unflatteringly compared to fish food (ok, who amongst my friends has actually tasted those little amino flakes? My lips are sealed) and the texture of another reminded us of a communion wafer, we all fully admit that we’d kill a whole box of any of the brands sampled while parked on the couch watching Parks and Recreation. An imperfect Cheez-It is still a mindlessly edible Cheez-It. Click the image below for a full-size PDF of our Taste Off. The group wasn’t as kind to the other kind of junk food we taste tested that night. Note to “healthy” cookie companies: when you get responses like “tastes like a basement” and “Is this a dog treat?”, it might be time to reformulate your recipes. What is this mysterious food? The answer is revealed in the April/May issue of ReadyMade. In the bowl of a stand mixer fitted with the paddle attachment, mix the cheddar, butter, and salt until soft and homogenous. Add the flour and mix on low speed; the dough will be dry and pebbly. Slowly add the water and continue to mix as the dough coalesces into a mass. Preheat the oven to 375˚. Line two baking sheets with parchment paper or Silpats. Divide the dough into two pieces and roll each into a very thin (1/8 inch or less) 10×12-inch rectangle. Using a fluted pastry cutter, cut the rectangles into 1-inch squares, then transfer to the baking sheets. Use the tip of a chopstick to punch a hole into the center of each square. Bake for 17 minutes or until puffed and browning at the edges. Watch carefully, as the high fat content of the crackers makes it a fine line between golden delicious and burnt. Immediately move the crackers to racks to cool.